From all across Jewish South Palm Beach County, men of all ages who care about premium time together as well as helping the community shared a special evening with the Jewish Federation of South Palm Beach County’s Men’s Division. 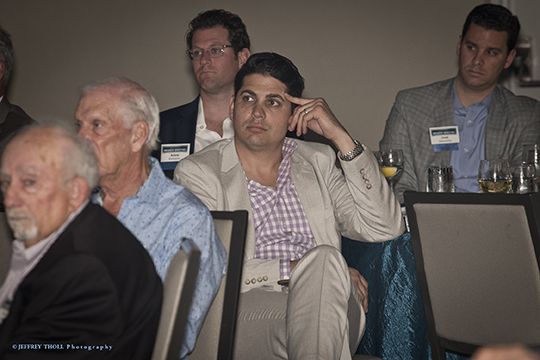 These Federation supporters gathered at the Waterstone Resort in Boca Raton on March 28 for an Insider Briefing with Lieutenant Colonel Peter Lerner, Former Israel Defense Forces Spokesperson for the Foreign Media, following cocktails and dinner. Speaking for his first time in South Palm Beach County, Lerner presented an analysis of security challenges facing Israel, including “terrorist organizations with arms and military capabilities beyond those of some actual armies.” He explained Israel’s continual state of preparedness on all fronts through intelligence, ongoing maneuvers, operational access, secured borders and advanced technology, and attested to the continued strong US/Israel relationship. Many thanks go to Men’s Division Co-Chairs Ira Holz, Ken Lebersfeld and Chuck Lichtman, and to the generous participating sponsors. Federation’s 2018 Men’s Division is sponsored by Sandelman Foundation, and the Insider Briefing was sponsored by BBT, Greenbrier, and HJ Sims. ESPN West Palm was the Media Sponsor, The Boca Raton Observer was Exclusive Media Sponsor, and Southern Glazer’s Wine & Spirits is In-Kind Sponsor.